”Hail, the Dark Lioness” Rocks the sky to tears as it hail on our way home! 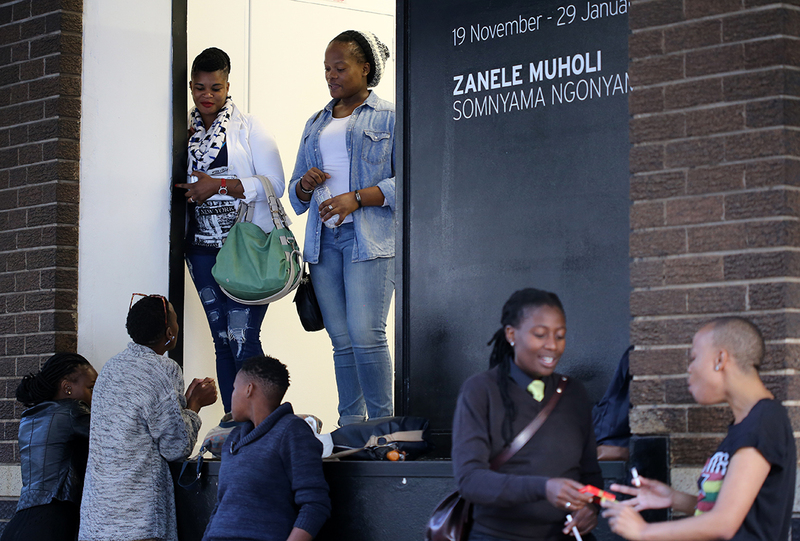 Yes, it literally hail hard as we left Stevenson Gallery, Johannesburg where the opening of Zanele Muholi’s exhibition entitled ”Somnyama Ngonyama (meaning Hail, the Dark Lioness)” threw back Thursday to appreciating black beauty. Zanele has turned the camera towards herself and captured her reflection in perfection. Daring dark dindy and the fresh flamboyant femmes framed on gallery walls. I can even ”taste” the beauty ofs long hair, lashes, beautiful bodies, dresses, make up, perfume and nail polish. The energy that fills the white walls with women – WOW effects! 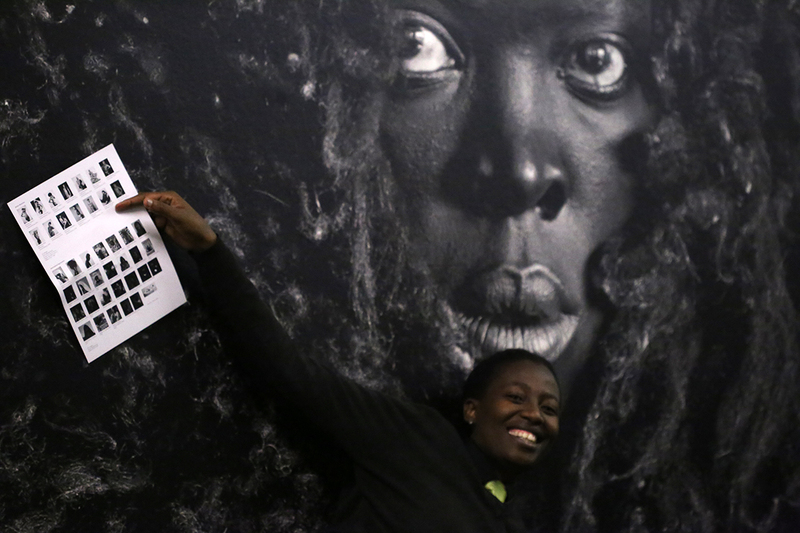 Black and white photographs of black LGBTI people poses on white walls. 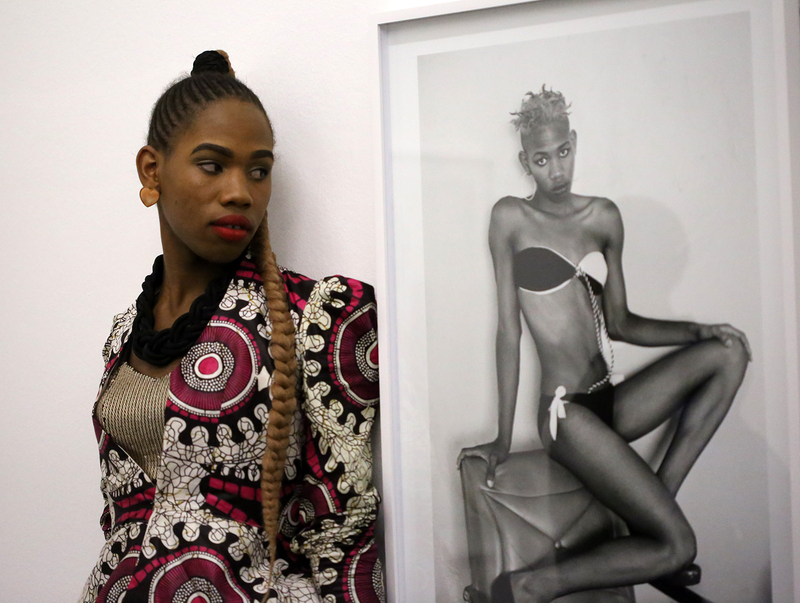 Muholi’s self-imagery (Somnyama Ngonyama) featuring her other series Brave Beauties (photographs of transwomen) is exhibited in Stevenson’s Art Gallery until 29 January 2016. The brave beauties performed dance and music miming at the opening night on 19th November 2015. They brought diversity of art to the exhibition, they are even operating a sound system – swapping and switching from phone to phone – music to music. Through all the excellent and hard work, they remained beautiful and well collected throughout the event. The bravery of accepting self – transitioning the body and facing the family, the community and self! That really takes balls!! Does one even really comprehend the adversity that transgenders face? It is easier to be still the family’s “girl” for a lesbian, but for a trans – the family needs to realize that, that is not the case. Being with Christie Van Zyl at this event took us down memory lane when we met the transgenders in Cape Town who came from various places in Africa to work on their documentary film “Exquisite Gender”. That was the first time Chris and I were faced with the true reality of TRANS! As we our eyes meet the Brave Beauties, featuring transwomen and feminine gay men on this exhibition. Muholi’s stamina that has become international has produced the beauty of art from a black and white collaboration – you can use your discretion… She has travelled the world and continues doing so. She has captured herself in different continents and compiled her hard work as an art exhibition, an expression! The privilege of capturing the event is something I will always be grateful of to Muholi. She has mastered the art of photography, well, to me that is. I don’t mean just from a point of being a photographer that captures breath-taking shots, freeze a moment and make it last forever. I also mean that she has mastered the art of photography from the aspect that she has shared the skill to so many people on an international scale; and they come to her events armed with guns that she has equipped them with, including me – and like soldiers, we shoot! Which photographer do you know that mentors so many people and unleash potential by also paying the price for it? It was beautiful seeing familiar individuals and other fancy faces at the event. The priceless opportunity of being reunited with people that we have met far and wide. 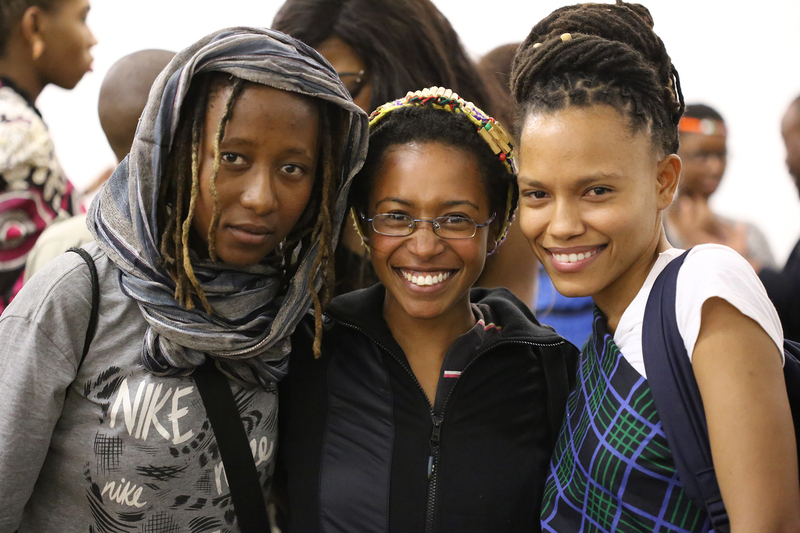 Muholi’s connections that are making the black queer network in Jozi. It seems as if Muholi’s entourage also includes a gallery, as Faces and Phases was exhibited by Stevenson’s Gallery in Cape Town and Johannesburg, now Muholi is flashing new body of work in the same space. Massive thanks to the organizing of transport that delivered us at the gallery and safely back home. As LGBTI’s from KwaThema it would have been a likely impossible for us to attend that event without transport or accommodation arrangements for the night due to long distance. Not everyone would have manage to pay a taxi fee of R20 for a 30minute’s drive from KwaThema to Jozi for an exhibition that begins at 7pm when taxis to KwaThema stop operating from Jozi CBD. To all that were at the event, you are beautiful and may peace be within. This is for all the late mothers, lovers, etc and broken hearts – Sukuma, ushaye izandla (get up, clap your hands) and believe in love! As Yaya Mavundla (also programme director of the event) had performed at the event the song by Naima K.
This entry was posted in Another Approach Is Possible, Archived memories, Creating awareness, Expression, Power of the Voice, South Africa, We Are You, We Still Can with/out Resources, Writing is a Right and tagged Art, Article and photos by Lebo Mashifane, beauty, Education, exhibition, Experience, Expression, Feelings, Friendships, Human beings, Inkanyiso media, Photography, Race and Politics, Sexuality, Somnyama Ngonyama, Stevenson gallery, Visual history, We love photography, Words. Bookmark the permalink.